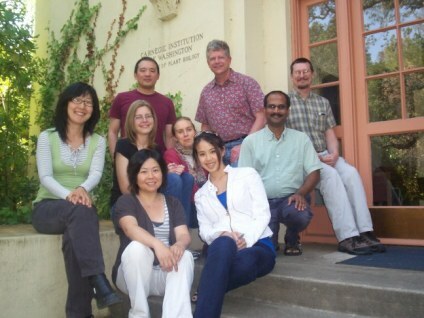 The PMN staff members work at the Carnegie Institution for Science in the Department of Plant Biology, located on the Stanford University campus. The PMN curators are involved in curating pathways from Arabidopsis into AraCyc, plus they also curate pathways from diverse species that can be entered into the appropriate species-specific metabolic databases, or directly into PlantCyc. In addition, all of the pathways supported by experimental evidence are entered into MetaCyc. PMN staff members will also be involved in the generation of new species-specific metabolic pathway databases, such as PoplarCyc. To send a general message to the PMN, please use our Feedback Form, but we also welcome messages to individual PMN staff members. Seung Yon (Sue) Rhee, Ph.D.
Collaborators curate pathways or provide support for individual species-specific databases that were created and/or maintained by them. There is data exchange between PlantCyc and the collaborators' databases. There is also coordination of curation to set consistent curation rules and eliminate redundant efforts. The release notes associated with each new version of PlantCyc list the information from the collaborators' databases that has been entered into PlantCyc. Each additional pathway entered may help to improve the ability of the Pathologic program to predict more pathways as new single species databases are generated using PlantCyc as a reference standard. PMN contributors from around the world have added to or helped to improve the content of AraCyc, PlantCyc, and the other PlantCyc-derived databases that are part of the PMN. In addition to the active contributions from the PMN editorial board and PMN collaborators, the following individuals have contributed significantly in improving the content of PlantCyc, AraCyc and the other PlantCyc-derived databases that are part of the PMN. Some contributors have contacted us with suggestions and revisions. Some have generously responded to appeals for help from the curators. Some have attended curatorial jamborees. We are grateful to our contributors and welcome any additional feedback from the community. We look forward to adding your name to the contributor list! The Plant Metabolic Network editorial board is an international assemblage of some of the world-class experts and leaders in varied domains of plant primary and secondary metabolism. Our board provides overall vision and guidance to the PMN project and plays an active role in ensuring the high quality of the information present in the PMN. More specifically, editors may review curated pathways for their accuracy and coverage before they are published online, either directly or via solicitation to other experts. They may also identify missing pathways and enzymes and inform curators of literature references to be used for curating new pathways or updating existing pathways. We are grateful to these distinguished individuals for their contributions! We thank Dr. Schroeder for his advice on polyketides. He passed away in March of 2011.